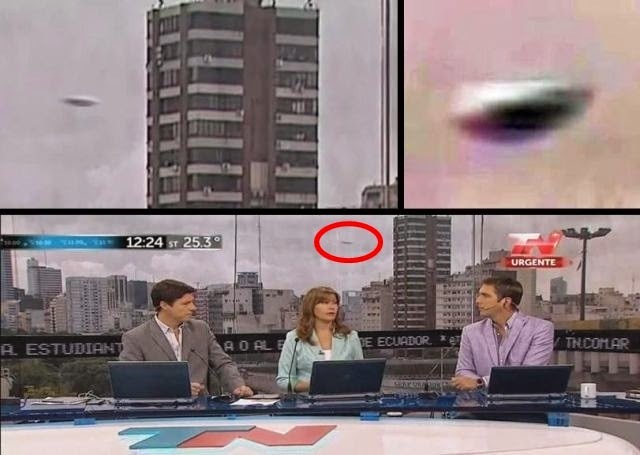 During a live broadcast of the news channel TN News in Argentina on March 3, 2015 a UFO appears behind the windows of the news room. Of course we may wonder if it is a computer-generated imagery UFO video but a YouTube commenter wrote that the UFO was really there. Note: The commentary can also be misleading and posted just to convince the people that the UFO is real. What do you think, real or fake? Todo Noticias (also known as TN) is an Argentine news cable channel. TN began broadcasting on Tuesday, June 1, 1993. It also has a news website (tn.com.ar) ranked as the 20th most visited in Argentina. Hmmm, dunno. On their own website TN have a story about a film crew encountering a UFO, so that proves the subject matter is not taboo to that site. Yet they had no mention of this story when I looked, surely it would've been on there as an exclusive. I am unable to believe a casual viewer saw this and 30 TV producers, directors and other staff didn't, especially since the very recent sighting from the TV crew. They are part of the mainstream program, privately owned. It doesn't matter How many of them saw it, they wont be allowed to report about it. Those are their orders, if they want to keep their jobs. I disagree, as I mentioned, on their website they have UFO footage filmed by one of their film crews. People go on about "The Truth" yet if they believe everything they see nowadays they are most likely being deceived, and once you believe a lie the truth is already lost. I would urge people to question and pick fault or risk following a lie blindly down the wrong path.